Like most almanacs, The Old Hermit's Almanac provides interesting and uncommon information that helps us navigate through the year. Unlike most almanacs, however, this one contains information and insight that helps us navigate through every year, that helps us find our way Home. 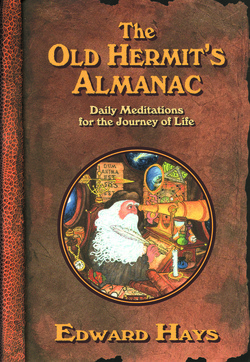 Containing a reflection for each of the 365 days of the year (each entry approximately one page long), The Old Hermit's Almanac also celebrates holy days and holidays, feast days and famous days of the past, and glimpses into the future. It marks accomplishments of yesterday that inspire us to live well tomorrow and points out "pedestrian" prophecies of the past, off-target predictions that show the folly of forecasting, especially those predictions that limit our possibilities.